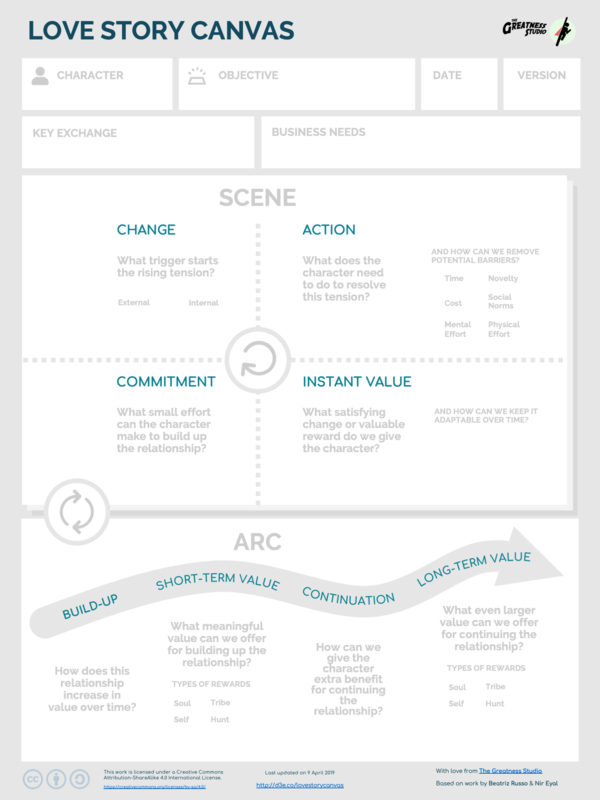 The Love Story Canvas is an ideation tool to help us connect our design ideas into a coherent narrative, so that people can more easily fall in love with our products & services. It combines behavior design with the science of love and dramatic theory. 👉 Download the PDF here. This talk at Social UX (see the slides) explains the theoretical background of the Love Story Canvas and how to apply it. This tool works well with the Journey Map Canvas (PDF) and can inform your journey mapping, interaction design, prototyping, and marketing strategy processes. During the talk at Social UX, Brian ran a micro-workshop with Yaroslav Derevianko, Founder & CEO of bamvélo.